Overshoes are probably our biggest selling winter accessory product and there's a very good reason why. 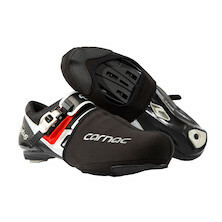 Essentially, unless you buy dedicated wet weather, insulated bike shoes or boots; your cycling footwear is unlikely to be particularly warm, and even less likely to be waterproof. Like all the body's extremities, feet get very cold, very quickly- particularly during cycling. 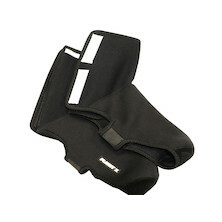 Overshoes remedy all that, in a simple, easily fitted and inexpensive product that no cyclist should be without. Often made from materials such as neoprene and lycra, cycling overshoes are available with differing seasonal usage applications in mind. Even in summer, overshoes serve to keep your shoes dry; the flip-side of that being cleaner, nicer smelling shoes that last a lot longer. 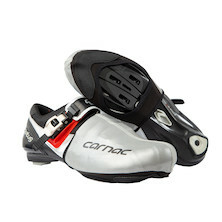 So, keep your feet clean, warm and dry with a pair of overshoes. 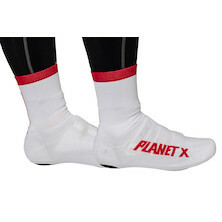 And we guarantee you won't find better value than our own Planet X models!